Our company is master in offering unmatchable quality of SS Thermowells. This SS Thermowell is extensively used in conjunction with the Digital Thermostat. Further, these products are known for their high performance. The products offered by us are of world class quality and available in market in bulk. MOC of thermowell is SS316. Our company is enlisted among the leading manufacturers and exporters of Stainless Steel Thermowell. In order to win the trust of clients, these wells are manufactured using premium-quality stainless steel and brass material that is procured from certified vendors of the market. This Stainless Steel Thermowell is known for its high performance and can be availed at industry competitive prices. 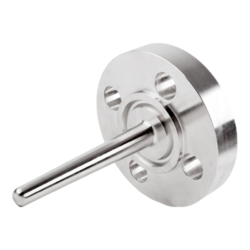 In order to achieve set targets of the firm, we are actively engaged in providing a supreme quality range of Stainless Steel Thermowells. The provided range is developed by using highest quality raw materials. With the help of efficient workforce and modern technology we manufacture SS Thermowell. They are of excellent quality and affordable. Placing an order with us is easy and we deliver as per the committed timelines. We are the Manufacturer & Exporter of FAV SS 316 Straight Thermowell.